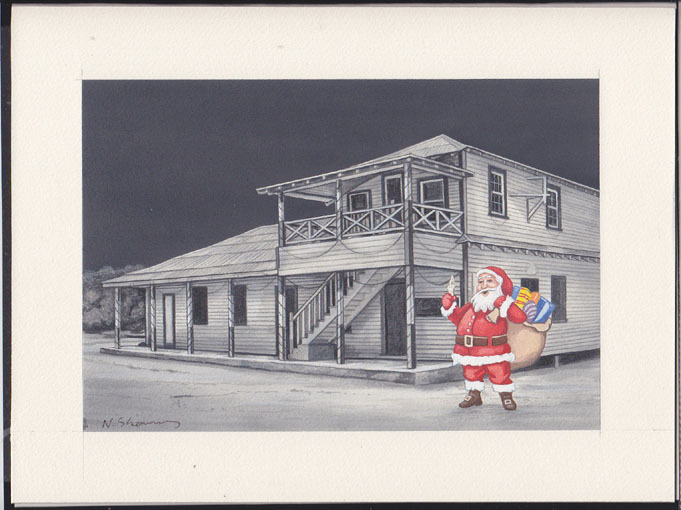 18376 MAQ CAYMAN ISLANDS (2013) Santa with bag of presents* outside Old Government House*. 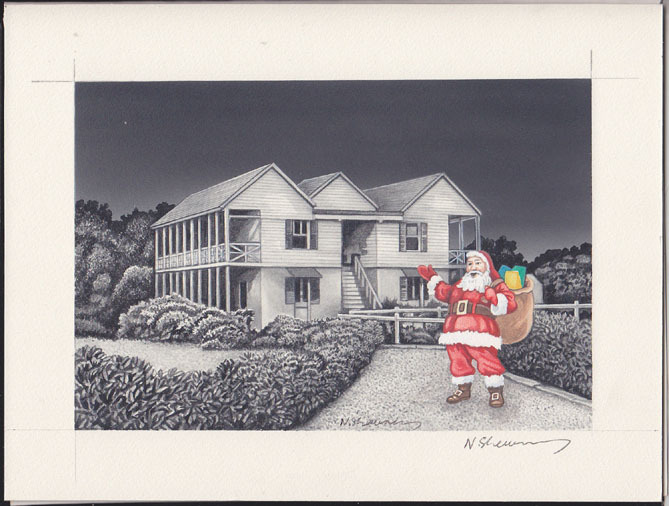 Original accepted artwork for Cayman Islands 2013 Christmas issue 25c value. Watercolor, pen and ink on posterboard, design measures 22 x 15 cm, signed by the artist Nick Shrewring. 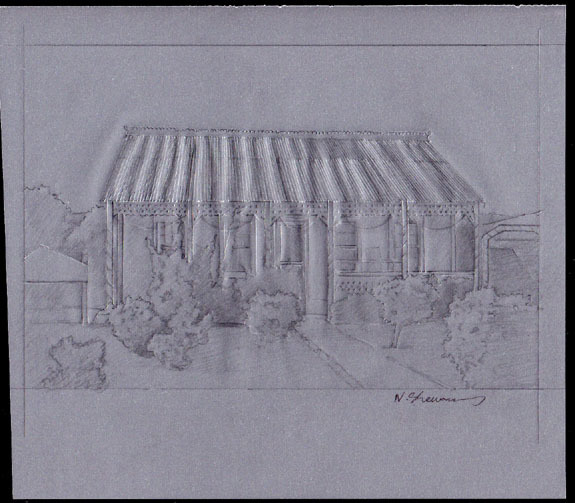 Additional coloring was added for the night sky and lights around the house and hedge. 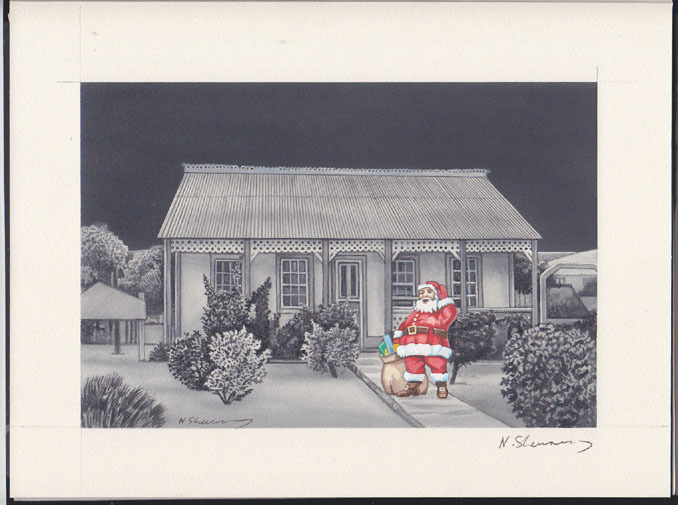 18377 MAQ CAYMAN ISLANDS (2013) Santa with bag of presents* outside Old Homestead*. 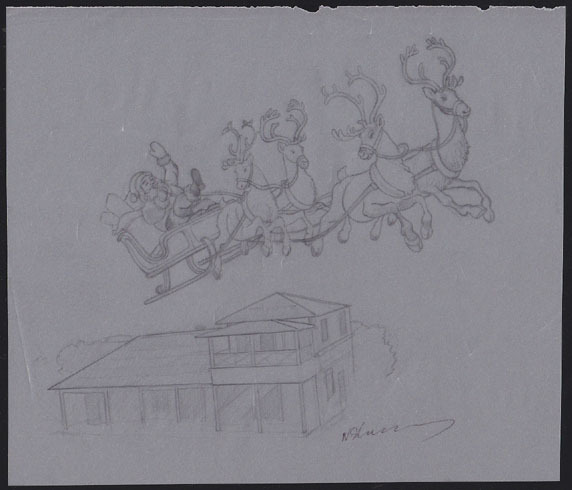 Original accepted artwork for Cayman Islands 2013 Christmas issue 75c value. Watercolor, pen and ink on posterboard, design measures 22 x 15 cm, signed by the artist Nick Shrewring. 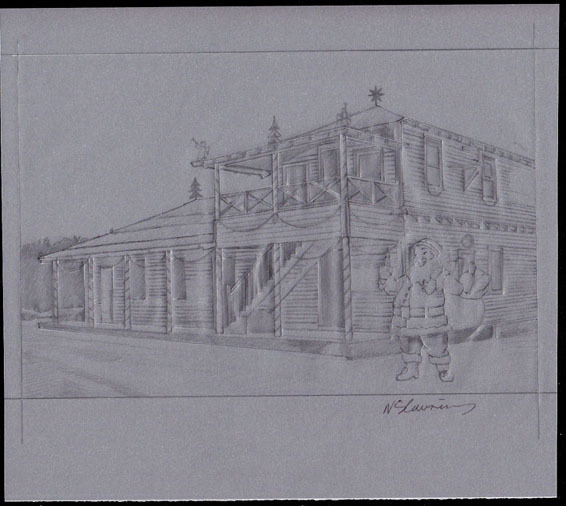 Additional coloring was added for the night sky and lights around the house and hedge. 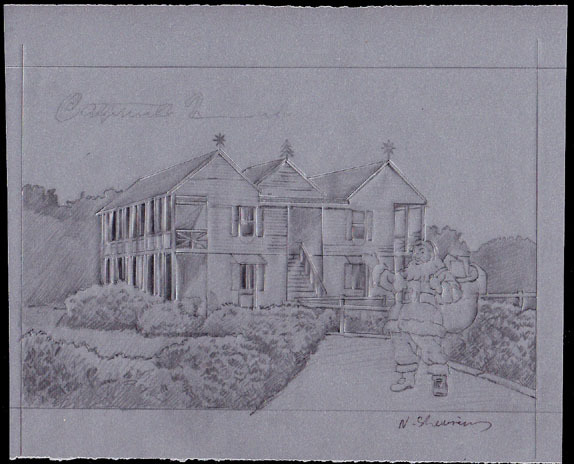 18378 MAQ CAYMAN ISLANDS (2013) Santa with bag of presents* outside Mission House*. 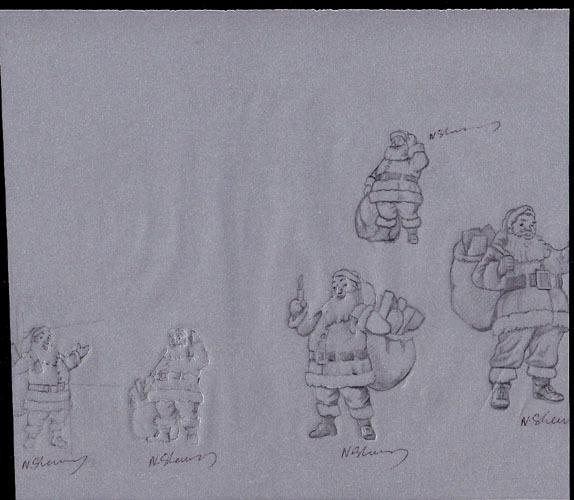 Original accepted artwork for Cayman Islands 2013 Christmas issue 80c value. Watercolor, pen and ink on posterboard, design measures 22 x 15 cm, signed by the artist Nick Shrewring. 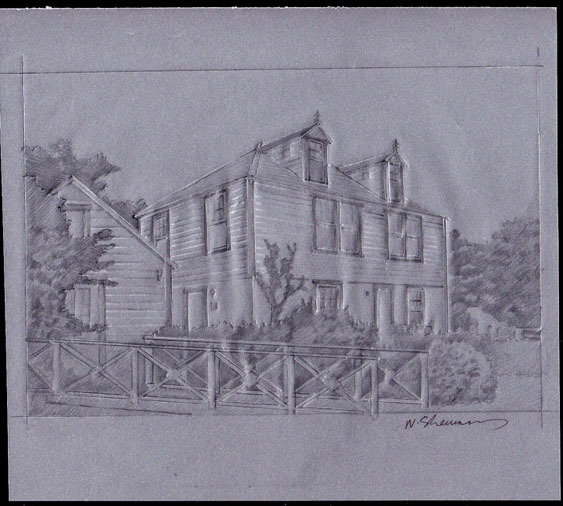 Additional coloring was added for the night sky and lights around the house and hedge. 18379 MAQ CAYMAN ISLANDS (2013) Santa with bag of presents* outside Old Government Administration Building*. 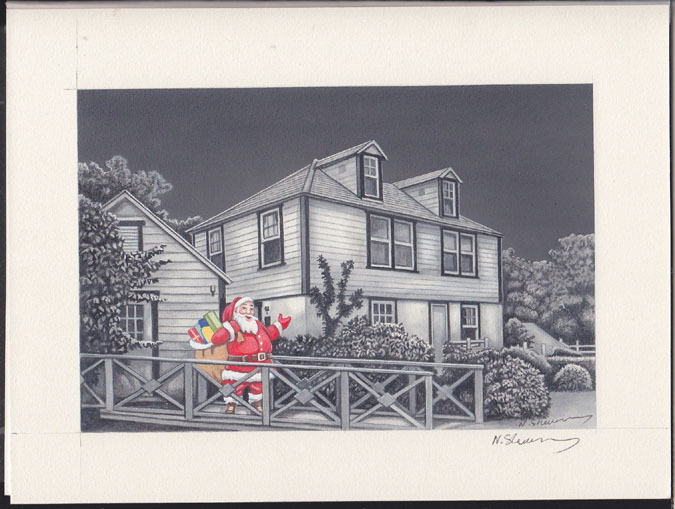 Original accepted artwork for Cayman Islands 2013 Christmas issue $1 value. Watercolor, pen and ink on posterboard, design measures 22 x 15 cm, signed by the artist Nick Shrewring. Additional coloring was added for the night sky and lights around the house..